Facebook rolled out a new look for the profile pages of its users last Sunday, coinciding with the broadcast of a 60 Minutes interview with its notoriously media-shy CEO Mark Zuckerberg. According to the company, the revamped profile pages now organize personal information in a way that highlights “the important people in your life, and all the things you have in common with that person”. Among the most obvious changes is the appearance of a first line at the top of the profile page that gives a short description of who the person is, as indicated by the user on Facebook. Information such as one’s workplace, school, current location, and birth date also appear on the profile page without having to click a separate tab or link. The Facebook profile redesign also shows a new string of photographs of the user, as tagged by Facebook friends and family. The application tabs – Wall, Info, Photo, Notes, etc. – have moved to the left of the page, under the profile picture; previously, these tabs were featured prominently at the top of a user’s profile. With the new look, Facebook also attempts to highlight a user’s most meaningful relationships, by categorizing one’s list of friends as either family, best friends, college friends, or co-workers. There is also a new list of common interests among Facebook users, placed on the right side of the profile page. The new Facebook profile, which can be accessed here, is an opt-in choice for the site’s 500 million-plus users, perhaps a response to the criticism that Zuckerberg implements site changes without first asking for feedback from the user base. A new viral awareness campaign on social networking site Facebook recently prompted many of its users to change their profile pictures to that of their favorite cartoon characters from childhood. Ironically enough, in attempts by users to determine who had created the campaign, the possibility was raised that pedophiles may have been the masterminds behind it all along. Rumors swept that pedophiles were simply hoping to narrow down which Facebook users were children. It has since been reported that these rumors were not true. Twitter has denied censoring the discussion of WikiLeaks (monitored via the hashtag #WikiLeaks) on its site, responding to rumors that the popular social media and microblogging network was leaving any posts related to the whistle-blowing site off its list of trends. WikiLeaks, which continued this week to generate widespread media coverage after controversies surrounding its recent release of secret US diplomatic cables (among many other documents), took its whistle-blowing activities to Twitter after the site was removed from its DNS server and Amazon. 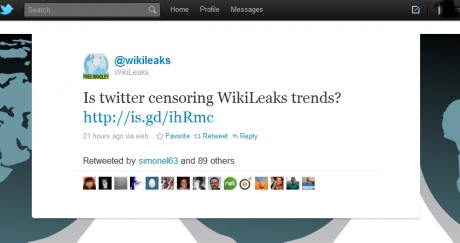 WikiLeaks, however, speculated that Twitter was censoring the WikiLeaks trend off its list of most-talked about topics – an allegation that Twitter’s communication director Matt Graves has denied.